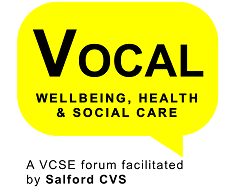 VOCAL Wellbeing, Health & Social Care Forum was established in 2016 and aims to improve wellbeing, health and social care fror the residents of Salford. It brings together Voluntary, Community & Social Enterprise (VCSE) organisations working with Salford Residents to improve wellbeing, health and care for mutual benefit, representation and to support their organisations development and capacity including the development of quality and good practice in their work. It provides broad ranging representation of the interests and views of VCSE organisations working with residents of Salford and represents these views to Salford Strategic Partnerships and commissioning bodies as agreed by the Forum. VOCAL Wellbeing, Healh & Social Care Forum representatives aim to ensure that our service users interests are considered and our member organisation’s expertise and diverse experience fully informs commissioning and strategy and works with partners towards a more effective, joined up service to better meet the needs of and improve health and wellbeing outcomes for the resident of Salford. Membership is open to any VCSE organisation working within the City of Salford. Sign up for our VOCAL Wellbeing, Health & Care Forum and E-Bulletin. Sign up here.